This will be the first of 2 blogs about Moles and Voles. 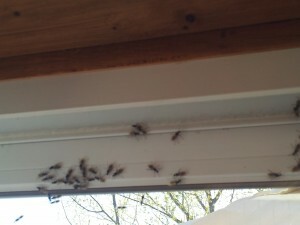 The posts will explain what they are, why they are considered pests and how to manage them. Moles are insectivores, which means they generally don’t eat plants, but instead they eat earthworms, insects, grubs, slugs and in some cases even small snakes or mice. Adult moles generally measure between 12-20 cm in length. They can range in colour from dark grey to brown and they have small eyes but big front paws with strong claws that they use for digging and tunneling in soil. Moles don’t hibernate and they can be active day or night year-round. However, the majority of their surface activity will happen now during the Spring or in the Fall. They are also solitary animals and will only have one litter a year of 3-4 young. Their young will stay with their mother in her tunnels for about 4 weeks. At about 4 weeks the young will start making their own tunnels and they will reach adult size in 4-8 weeks. It’s been noted that they don’t eat plants, however they can still cause tons of damage to plants and roots because of their digging and tunneling. They can destroy lawns or gardens with their tunnels by removing dirt from around the roots, which can cause the plants to dry out and die. Moles can be considered beneficial because of what they eat, however because of their tunneling and digging they are also considered pests. If you suspect that you have moles, voles or any other sort of pest problem, Cottage Country Pest Control is happy to help – give us a call at (705)534-7863 or email us at ccpestcontrol@gmail.com . Ross was all set to head off to do a couple of spider sprays today, but it’s just too windy for it, especially anywhere near water. This is part of offering responsible integrated pest management services – although the spray that is used is relatively safe for humans and pets, it is – for very good reason – absolutely ill-advised and illegal to allow it to enter the lake. Because of that, we take great care to ensure that we don’t spray when it is too windy to control the spray near water, and we use alternative application methods when needed to safely treat docks and boathouses. It can be a royal pain in the schedule sometimes – but it matters. Georgian Bay – and the fish and birds and wildlife that depend on it – are under quite enough stress without adding to it. nope… not our service area… but our blog, you may have noticed, has moved from our old site on blogger – http://cottagecountrypestcontrol.blogspot.ca/ – to here. Still lots of information available over there, though … so I should, I suppose, be including some links to those, or moving them here, or something! Definitely need to something about that though… too much good info over there to just walk away from it. How’d you like that snow yesterday? Imagine, snow for Mother’s Day! It’s just NOT right! The wasp that was busy building a hive in our little tin boat didn’t seem too happy about it – or about Ross disturbing it’s project either! Funny … he takes such care to not get stung when he’s dealing with other people’s bee and wasp problems… but moving boats in a snow storm and he manages to get stung! Oops! Even though the weather has not exactly cooperated this week – sunny and gorgeous, but SO freaking cold! – lots of people in both the Balm Beach and Honey Harbour areas have been up to their cottages to find that they’ve been visited by carpenter ants. Those are the big (usually) black ants – sometimes with wings – that can, over time, do a significant amount of damage to your home or cottage. Although they don’t actually eat wood, they do tunnel through it to build their nests – and those tunnels will weaken the structure. Aside from identifying the ants themselves, you can often tell you have them by the piles of frazz (sawdust) they leave around their work sites. In serious infestations, you can actually hear them in the walls. Conditions are great for carpenter ants up in this area, unfortunately – but fortunately, Cottage Country Pest Control can help you to rid your home or cottage of carpenter ants using a multi-faceted approach that includes several types of strategies and products. Ross is a fully licensed and insured exterminator, and has a great deal of experience with carpenter ants – he will solve your carpenter ant problem at a time that is convenient for you. Our boat is not being cooperative this year, so we’re not doing island calls with it yet this season, but he is spending a fair amount of time servicing the islands up in the Honey Harbour area anyway, getting picked up at whatever marina is closest. Hopefully we’ll have the boat fixed this week but we’ll see… really depends on how busy he is … hasn’t had much free time to actually work on it. And then, of course, when he did have a few hours for it yesterday, he discovered they’d given him the wrong part! Not TOO frustrating! Anyway, if you’re having any sort of pest problem at your home or cottage, do give us a call at (705)534-7863, or email us at ccpestcontrol@gmail.com and I’ll do my best to fit you in at a date and time that is convenient for you. What a busy start to the day today … and of course, Friday’s are my one day when I’m not here to deal with the phones, emails, etc… heading off to teach in Barrie, but hopefully he’s got enough to get done before it rains (what IS it with raccoons and boats this year?! Another one today) …. and I’ll respond to messages and emails when I get home. Not quite the welcoming committee one wants on the first trip up to the cottage… a whole swarm of winged carpenter ants in search of a new home. This cottage will NOT be their new home… Ross will be up there soon to take care of the problem using a multi-faceted and environmentally responsible IPM approach. Have fired our old computer system and now I’m in the process of converting everything over into a database of my own making so that we will be better able to keep track of who needs call-backs and all that fun stuff. It’s a bit of a pain in transition though – so if we missed calling you to book your spring spider spray anyplace within Tiny, Tay, Simcoe Townships, or in Muskoka or Ramara or…. well you know…cottage country! …. do give us a call at 705-534-7863, or email ccpestcontrol@gmail.com and I’ll be happy to send Ross out to spray, or to solve any other pest problems at a time that is convenient for you. Very busy all of a sudden… gotta like that… well, aside from the fact that it means that our customers are already discovering issues with carpenter ants, bedbugs, roaches, etc…. Not to worry though – we’ll be happy to help you solve all your pest problems. Give us a call at 705-534-7863, or email ccpestcontrol@gmail.com and I’ll be happy to send Ross out to solve your problems at a time that is convenient for you.